In the early hours of this fine Friday morning, folks in Moscow sent a direct message to Exxon and all future shippers of oversize tar-sands related equipment that no road should accept the movement of equipment being used in the genocide of First Nations communities and environmental destruction in Northern Alberta. 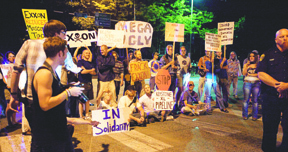 In light of Exxon’s recent shift to using alternative Idaho roads and trucking smaller pieces of equipment, the protest in Moscow is a significant one. The issue isn’t simply just the beauty and integrity of Highway 12, but the need for all peoples to stand in solidarity with each other as we face the increasing torrent of environmental destruction here and around the world. Below is the blurb re-posted from It’s Getting Hot in Here. Kudos to those who had the courage of their convictions to block the megaload and get arrested. It’s too easy to wring our hands and complain as we allow ourselves to be run over by corporate power – again and again. More power to you. Good on you, Muscovites! Keeping the Wild West green woo-hoo!